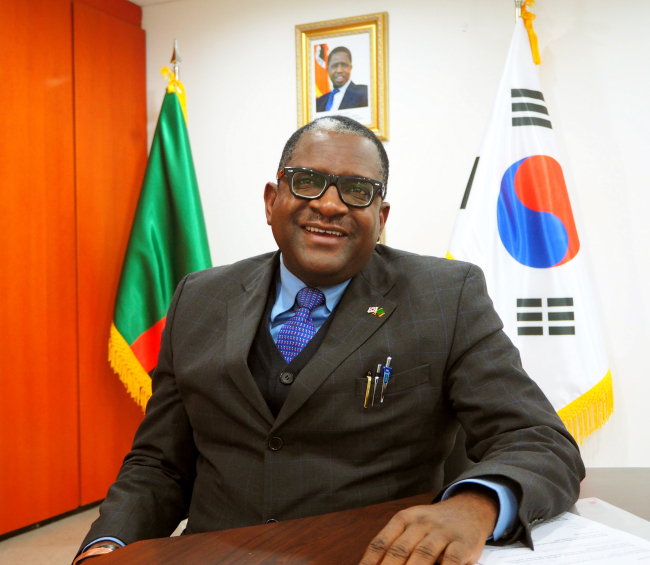 For Zambian Ambassador to Korea Wylbur Simuusa, rectifying the mismatch between Zambia’s solid position in Africa and its obscure presence in Korea is one of his most urgent tasks. Zambia is known in Africa as a nation of peace and stability, an honest broker that has mediated numerous peace agreements and helped neighboring countries gain independence, he told The Korea Herald. It has also sheltered countless freedom fighters and refugees from bordering countries, while having no major internal conflict since independence from the United Kingdom in 1964. On the economic front, Zambia stands solidly as one of Africa’s largest copper mining economies and a major food producer with its large landmass and abundant water resources, the newly appointed envoy said. The World Bank named Zambia one of the world’s fastest economically reformed countries in 2010. On the other hand, that most Koreans don’t know about Zambia could work to attract attention and investments, he stressed. 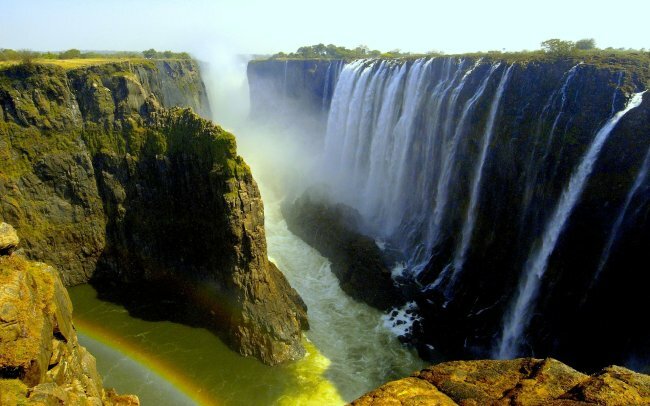 “I want to present Zambia as a country of opportunities for business and investment, a land of adventure and tourism with Victoria Falls, wildlife and historical artifacts that help understand human evolution and migration,” the envoy said in an interview at the embassy in Seoul in February. Zambia’s post-independence foreign relations were largely centered on supporting liberation movements in other Southern African nations, and during the Cold War, the country was a member of the Non-Aligned Movement. Kenneth Kuanda, the first president of Zambia, played a key role in regional diplomacy, cooperating closely with the United States to resolve conflicts in Zimbabwe, Angola and Namibia. “Our founding president was big on unity and worked hard to ensure the country was well integrated among our 73 tribes and seven major tribal groupings,” said the diplomat. The country sits on many African Union committees related to security and conflict resolution, and is recognized by the United Nations as one of the most peaceful African countries, he stressed, adding it has some similarities to Switzerland. English is the official language of Zambia, and the British institutional legacy remains in the Zambian parliamentary political system, common law, judiciary and public administration. “But in terms of Zambia-Korea relations, I have to admit it’s slow,” the politician-turned-diplomat conceded. Prior to his inaugural ambassadorship here, Simuusa was the minister of foreign affairs, minister of agriculture, livestock and fisheries, minister of lands, natural resources and environmental protection and minister of mines, natural resources and environmental protection from 2011-2015. Zambia and Korea established their diplomatic relations in 1990. From 1987 through 2015, Seoul had granted $6.6 million of official development assistance to Zambia covering public health, aquaculture, capacity building and technical assistance. Currently, the details of $42 million of credit assistance through the Economic Development Cooperation Fund are being coordinated, which has been approved but yet to be implemented. It targets electronic governance for public safety, urban administration and infrastructure. “We derive almost 100 percent of our electricity from hydropower,” the ambassador said, but added the country has an annual energy deficit of some 1,000 megawatts. Due to global warming, water levels in dams have gone down and droughts have been exacerbated, leading to more demand for hydro dams and solar energy plants, alongside wind, biomass and nuclear energies, as Zambia has abundant uranium. Zambia also has high quality of emeralds and precious stones as well as semiprecious stones, he explained. Simuusa welcomed Korean investments in renewable energy and copper processing, highlighting that the added electricity would give a substantial boost to the country’s manufacturing industries. Another key sector in need of assistance and investment is public health, according to the envoy. “HIV-AIDS, kidney diseases, cancer and diabetes have been prevalent, but there are now concerted efforts to roll them back by increasing the number of doctors, nurses and clinical assistants and building more hospitals and clinics, particularly in rural areas,” he said. As Zambia doesn’t manufacture any drugs and imports them from abroad, especially from South Africa and India, Korean pharmaceutical companies and medical staff can come into the country for the sale of drugs, diagnosis and treatment, while targeting the whole region, he added. As the last key area, Simuusa pointed to the ongoing efforts to introduce mechanization and electrification across rural areas and the agricultural sector. Koreans interested in visiting Zambia can get visas from the embassy and reach the country via a layover at Dubai or Addis Ababa.